What are causes of pseudogout? What are risk factors for pseudogout? What are pseudogout symptoms and signs? How does a doctor diagnose pseudogout? What are treatments for pseudogout? What other conditions can accompany pseudogout? Are there special circumstances that can promote attacks of pseudogout? What are complications of pseudogout? What is the prognosis of pseudogout? Is it possible to prevent pseudogout? Where can people get more information about pseudogout? Pseudogout is caused by crystals in a joint. Pseudogout causes arthritis (joint inflammation). Pseudogout can cause calcification of cartilage. The arthritis of pseudogout is diagnosed by detecting typical crystals in joint fluid. Treatment of pseudogout is directed at the inflammation. Pseudogout can be associated with other illnesses. Pseudogout is a type of inflammation of joints (arthritis) that is caused by deposits of crystals, called calcium pyrophosphate, in and around the joints. Pseudogout literally means "false gout." It derives its name from its similarity to gout. Pseudogout has many similarities to true gout, which also can cause arthritis. 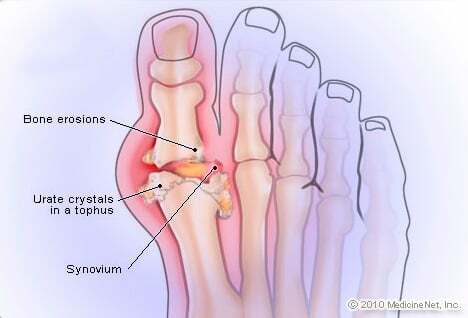 However, the crystal that incites the inflammation of gout is monosodium urate. The crystals that cause pseudogout and gout each have distinct appearances when joint fluid containing them is viewed under a microscope. This makes it possible to precisely identify the cause of the joint inflammation when joint fluid is available. Pseudogout has been reported to occasionally coexist with gout. This means that the two types of crystals can sometimes be found in the same joint fluid. Researchers have also noted that the cartilage of patients who had both forms of crystals in their joint fluid was often visibly calcified, as seen on X-ray images. Pseudogout is primarily caused by the precipitation of calcium pyrophosphate dihydrate crystals developing within a joint space. Pseudogout has sometimes been referred to as calcium pyrophosphate deposition disease or CPPD. Pseudogout is clearly related to aging as it is more common in the elderly and is associated with degenerative arthritis. Acute attacks of the arthritis of pseudogout can be caused by dehydration. This is particularly common in hospitalized patients and those recovering from operations, especially when associated with dehydration. Pseudogout can also be caused by the hormonal effects on calcium metabolism from hyperparathyroidism. Colchicine is used for the treatment of acute flares of gout. It also is used for treating FMF in adults and children 4 years of age or older. Other unapproved uses of colchicine include treatment of pseudogout, amyloidosis, and scleroderma. Older age and a history of joint trauma (either due to an accident or surgery) are risk factors for pseudogout. 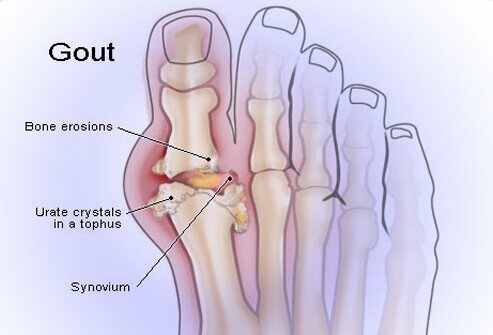 Additional risk factors for pseudogout include hyperparathyroidism, amyloidosis, gout, and degenerative arthritis (osteoarthritis). Pseudogout can result in arthritis of a number of joints. The most common joint affected is the knee, but it can also involve the wrists, shoulders, hips, and/or ankles. Pseudogout usually affects only one or a few joints at a time. The "attacks" of joint inflammation, characterized by acute joint swelling, warmth, stiffness, and pain, may last for days to weeks and can resolve spontaneously. The inflammation leads to loss of range of motion and function of the involved joint. Pseudogout is suggested when abnormal calcifications are seen in the cartilage of joints on X-rays. These calcifications are referred to as chondrocalcinosis and very suggestive of a diagnosis of pseudogout when there is also inflammation of the involved joint. The diagnosis of pseudogout is ultimately made when fluid from a joint is extracted and is examined under a special microscope called a polarizing microscope. With this microscope, the calcium pyrophosphate crystals are clearly identified by their characteristic shape and color (medically term weakly positively birefringent rhomboid crystals). The arthritis of pseudogout is common in older adults, particularly in the context of dehydration such as occurs with hospitalization or surgery. The treatment of pseudogout is directed toward stopping the inflammation in the joints. Local ice applications and resting can help. Nonsteroidal anti-inflammatory drugs (NSAIDs) such as ibuprofen (Advil) and others are often first drugs of choice. Removing fluid containing the crystals from the joint can reduce pain and help the inflammation to diminish more quickly. Cortisone injected into an inflamed joint will also help decrease the inflammation. Colchicine (Colcrys) is a medication used to decrease inflammation in patients with gout and may also be helpful in pseudogout. Corticosteroids taken as a pill can help if the patient can't tolerate colchicine or NSAIDs. Long-term prevention of recurrent pseudogout is often best achieved with small daily doses of colchicine and optimal hydration. Pseudogout can occur along with aging, be inherited, or be associated with hemophilia, hemochromatosis, ochronosis, amyloidosis, or hormonal disorders (such as hyperparathyroidism and hypothyroidism). These illnesses, as well as others, are considered in the initial evaluation of a patient with pseudogout. Arthritis attacks of pseudogout can be precipitated by dehydration and not infrequently follow surgical procedures in elderly patients. Pseudogout can be complicated by difficulty in walking and injury to the cartilage and bone of affected joints. The outlook of pseudogout is generally very good. Aggressive treatment of the inflammation can lead to complete resolution of the inflammation, pain, tenderness, and loss of joint function. While this can last for weeks, the inflammation of resolves within days with proper treatment. Recurrent attacks of pseudogout and chronic joint inflammation can lead to injury to the affected cartilage and bone. Patients with known pseudogout should stay well hydrated before and after operations to minimize the risk of attacks of pseudogout. Resting the joints may help during a flare-up. Pseudogout is treated by general practitioners, family practitioners, internists, rheumatologists, and orthopedists. People can get more information about pseudogout from the Arthritis Foundation. American College of Rheumatology National Meeting, 2011. What were the symptoms of your pseudogout? What were the treatments for your pseudogout? What prevention measures do you use to avoid getting a pseudogout?